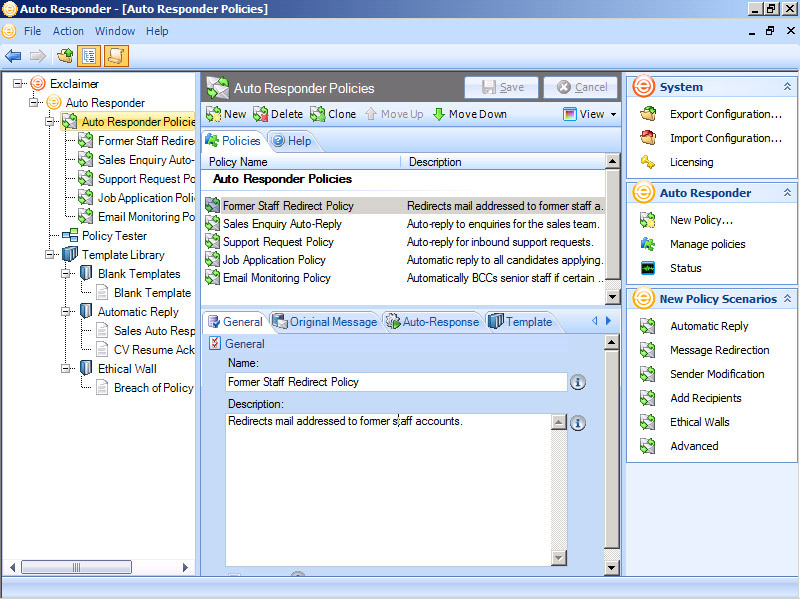 Get full, centralized control over automated email responses sent through Exchange. 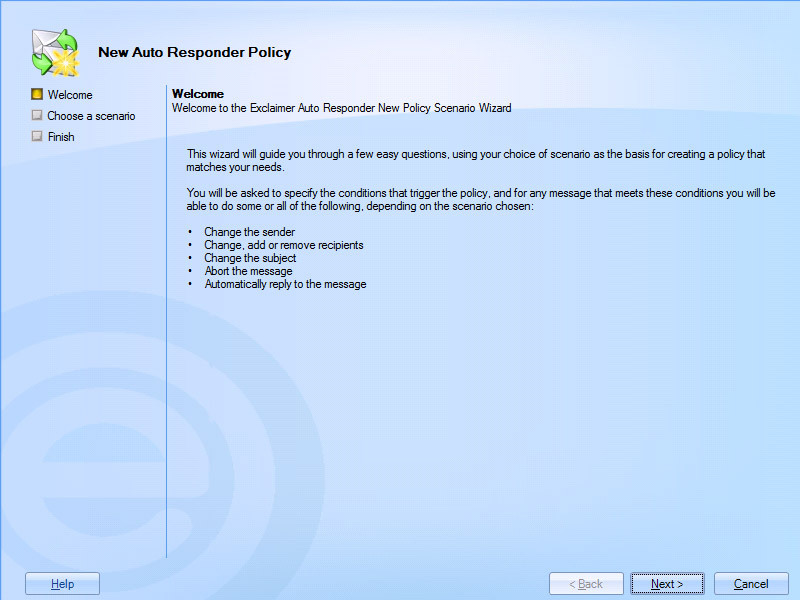 Exclaimer Auto Responder is the award-winning auto reply software for Exchange 2019/2016/2013/2010/2007. The dedicated Exchange software solution lets you automate replies to emails, redirect messages, add and remove senders and recipients from emails, as well as prevent messages from being delivered. 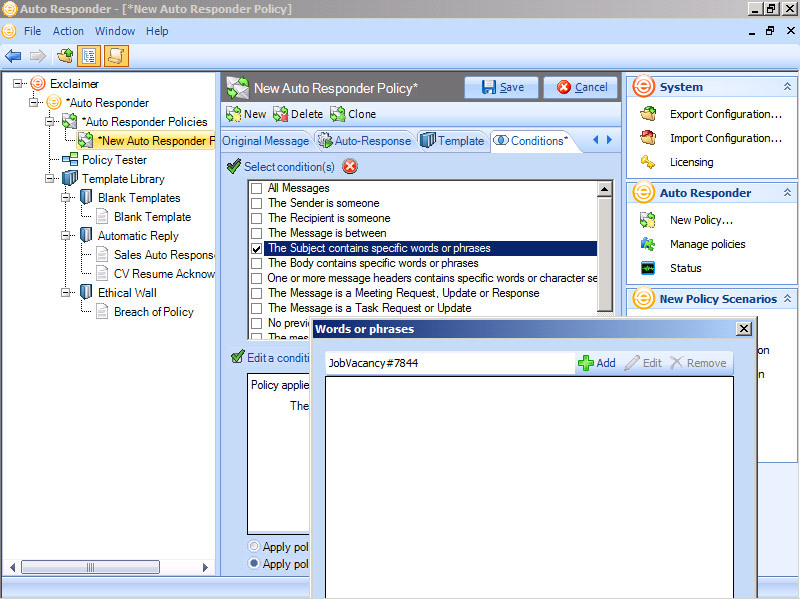 This is all based on rules and policies that you control within this Exchange auto reply software. Create personalized auto responses by including the sender’s original email message, add company branding and attach files such as PDFs. Redirect messages to new domains or group mailboxes instead of sending to individuals, reducing the demand on your Exchange server. Use any data in the email as a trigger such as text in the message body, the subject or the address. Unleash advanced mail control settings such as modifying the recipient’s email address or adding a Bcc address to monitor someone’s email. Show a team email address, like ‘sales@’, to customers, but not to colleagues or suppliers. Exclaimer Auto Responder is the only software of its kind to pass Microsoft's rigorous tests and achieve a Microsoft Certified for Windows Server status. Our Exchange auto reply software has also won the ‘Best Exchange Administration Tool’ in the MSExchange.org Readers’ Choice Awards. 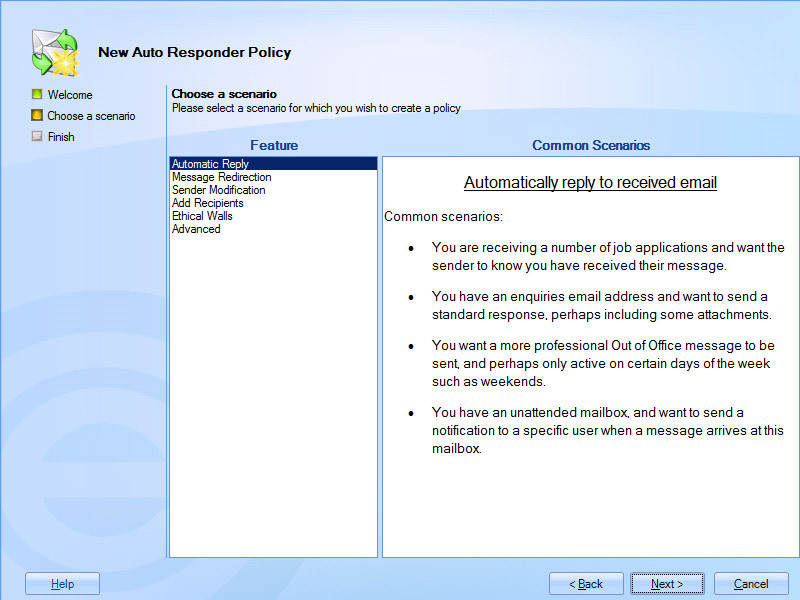 Create rules that tells the Exchange auto reply software what action to take for automated email responses. 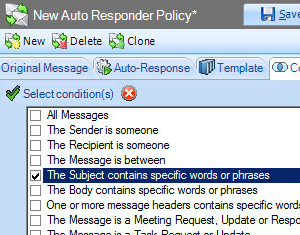 Base rules on attributes of an email such as key words or phrases in the message body or subject line. Use the sender or recipient's email address or properties from their Active Directory profile such as their Group or OU membership attributes. 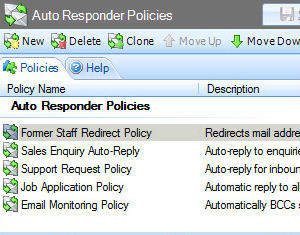 Combine rules with reply templates to create policies such as including an attachment on all email replies. 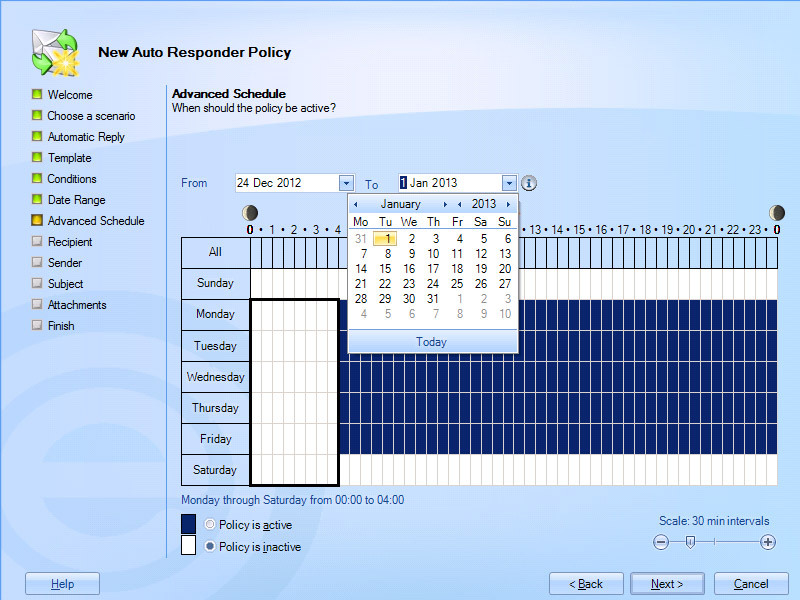 You can create as many policies as you want and set them for specific time periods. 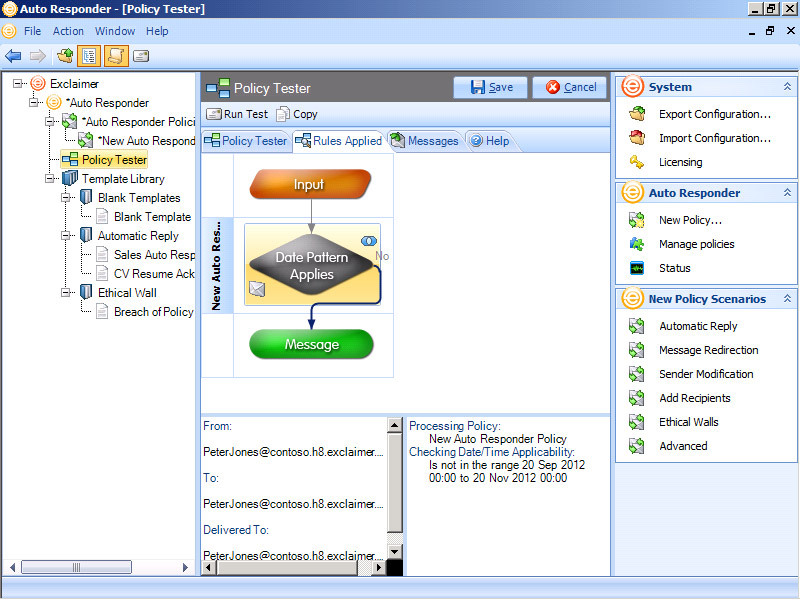 Test all of your policies before you deploy with the comprehensive Policy Tester. 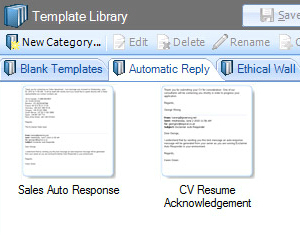 Design auto replies to look just like you manually typed them into Outlook using powerful Exclaimer signature templates. 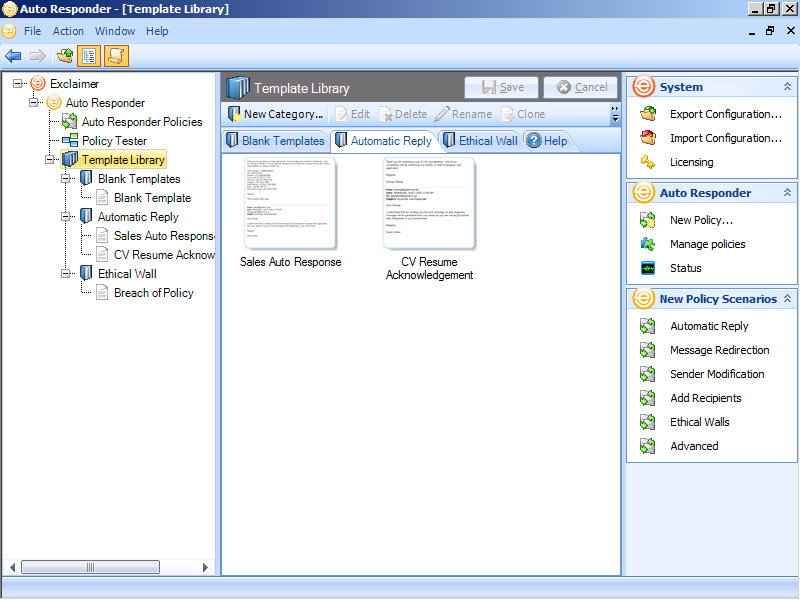 Utilize the same template technology for auto responses as our market leading email signature software solutions. Add images, text and social media in the comprehensive editor for replies processed by your Exchange server. 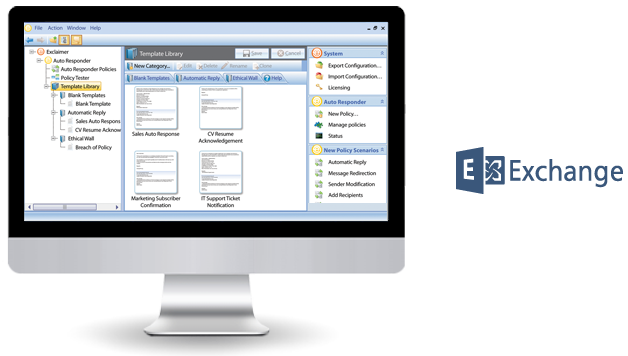 Use the Scenario Wizard to set out your requirements, complete with hundreds of pre-made policies. Delay auto responses so they are not sent instantly to the recipient. Set a reply to be sent an hour after receipt of the original message to provide a more ‘human’ touch. Fill dynamic fields such as the sender/recipient’s forename with details straight from the Active Directory and build the exact subject message you require. 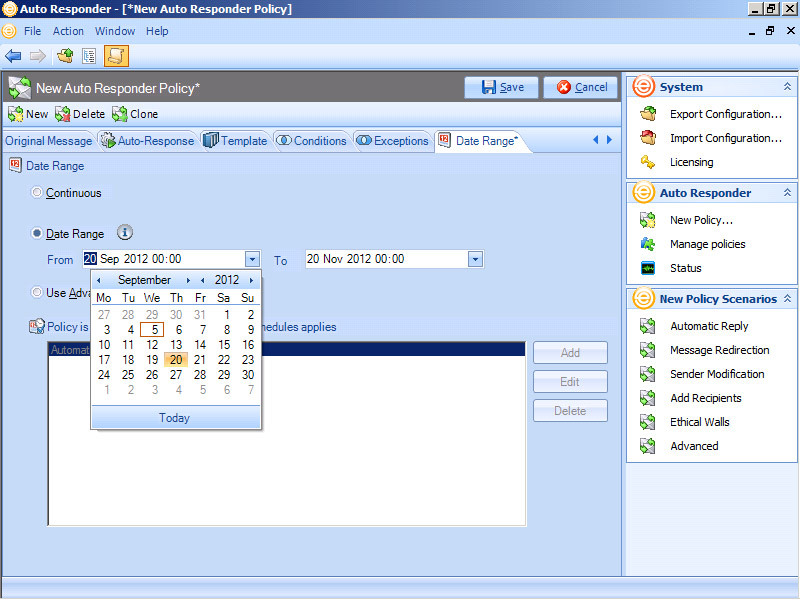 With dedicated auto response software, the possibilities beyond simple auto replies are limitless. You just drop in the data and the software does the rest. Let sales staff send prospective customers information like price lists or FAQs (frequently asked questions). Blind copy management on emails to employees who are facing disciplinary proceedings. Have auto responses go out at certain times to increase recipient open rates. Redirect messages sent to people that no longer work at your organization. Have the human resources department acknowledge applicants applying for a new job role whilst avoiding time and mailing costs. Block email between certain groups for Ethical Wall policies. Want to find out how Auto Responder can benefit your business? Contact/talk to us today.